A Los Angeles County Superior Court judge issued a temporary restraining order against Alliance College-Ready Public Schools late yesterday, ordering its administration to cease stifling a unionization effort. The LA teachers union, UTLA, is currently attempting to unionize the teachers at the charter school organization, which is LA Unified’s largest with 27 schools and around 700 teachers who are currently not represented by any union. Alliance has attempted to discourage the effort in ways that both UTLA and the Public Employee Relations Board (PERB) claimed were illegal. The temporary restraining order request to the court came last week from PERB, which had ruled in favor of UTLA’s complaints and filed a formal complaint in state court in August. A hearing had been set for Nov. 2 before an administrative law judge regarding the complaint. PERB’s arguments for a TRO and injunctive relief were outlined in a letter to a lawyer representing UTLA. Stay 100 feet from a conversation between union representatives and teachers. 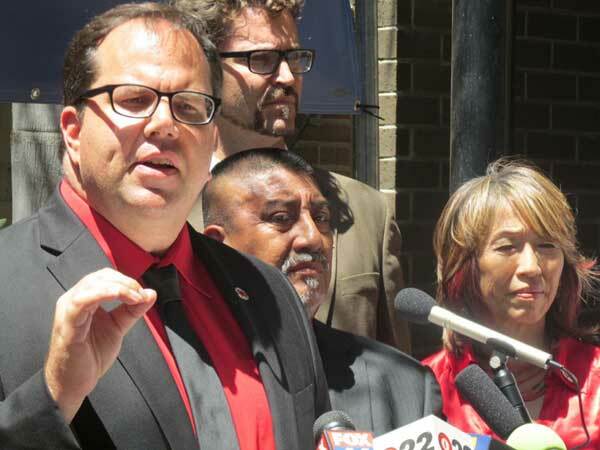 Allow UTLA representatives access to schools sites after-hours. Provide every certified employee with a copy of the TRO. The administration of Alliance has been vocal about opposing the unionization attempt by UTLA but has maintained that its activities are legal and simply an information campaign to educate its teachers. In a statement that echoed past ones, Alliance said it will respect the court’s ruling but that it was essentially based on misinformation provided to PERB and the court by UTLA. One of the PERB complaints — that Alliance had retaliated against a teacher, Albert Chu, and fired him for union activity — was stricken from the TRO because the judge found the complaint to be a separate issue and more appropriate for a lawsuit. Alliance denied the claim, anyway. Catherine Suitor, a spokesperson for Alliance, said despite the ruling, “very little has changed” because the accusations are false. She said the only real change is that UTLA representatives will now be allowed access to school sites after hours. “We do not coerce employees, and we never would,” she said, adding that Alliance agrees with the judge that no one should coerce or retaliate against employees. Suitor also denied that Alliance had blocked UTLA emails. “Teachers have discussed freely, including through email their opinions about unionization,” she said. Suitor also said that during a hearing, the judge denied UTLA and PERB’s request to bar Alliance from “disseminating communications” about UTLA, which Alliance is painting as an attempt by UTLA to infringe on the organization’s first amendment rights. After the request for a TRO was issued last week, Suitor said UTLA has failed to gain the support of a majority of its teachers and was engaging in delay tactics in court to buy more time, and today’s statement repeated the claim. She also suggested that PERB was biased against Alliance because a majority of the PERB board has pro-union backgrounds. All the parties involved were ordered by the judge to appear in court on Nov. 17 to argue why a preliminary injunction of 90 days should not be issued. UPDATED to show the TRO stated that Alliance “must not” ask employees about their beliefs, it did not say Alliance must “stop” asking.